Using ReaSoft PDF Printer, you can reliably create high-quality PDF documents without high costs. 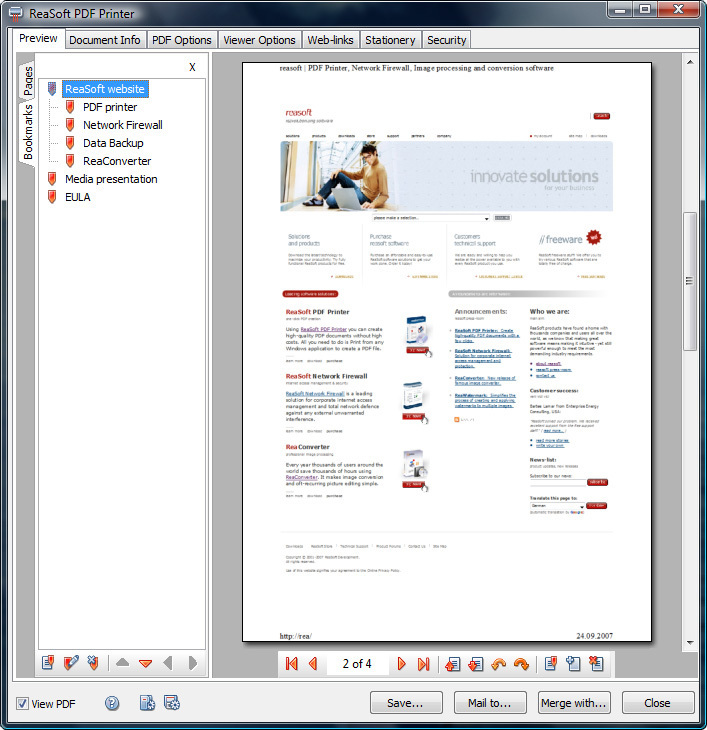 It installs as a virtual printer on your computer, so all you need to do to create a PDF document is to print it from any Windows® application. Installing ReaSoft PDF Printer is a very quick and simple process. The Setup Wizard takes you through a few steps where all you need to do is to get familiar with our license agreement and select the folder where to install the printer. When the setup is over, you can choose whether to run ReaSoft PDF Printer Wizard (the Wizard for quick configuration of the printer) right away or some time later. This can be any time, as the Wizard lives in the Start menu. 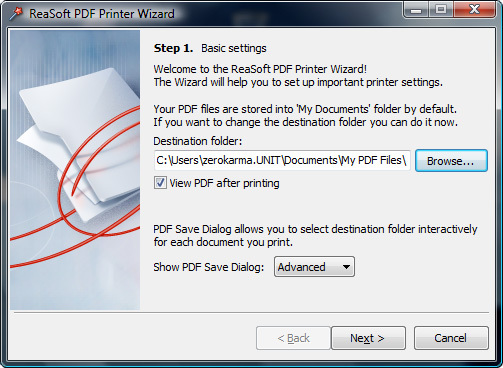 For more detailed configuration, you can use ReaSoft PDF Printer Settings found next to ReaSoft PDF Printer Wizard. ReaSoft PDF Printer Wizard is intended for quick configuration of the printer, and helps to set up the most important settings. ReaSoft PDF Printer Settings is intended for more detailed configuration. Depending on your needs, you can use either one. ReaSoft PDF Printer works as a virtual printer, which enables you to quickly create PDF documents by printing them directly from within Windows® applications. All you need to do is to press the "Print" button in the program you are working in (this can be any program that has a "Print to" option, i.e. MS Word, Internet Explorer, Paint, etc). If the PDF Save Dialog option is set to "None", your document will be saved as PDF automatically. If it is set to "Simple", you will be able to interactively choose the saving folder every time you print a PDF document. With the "Advanced" PDF Save Dialog, you will be able to preview your PDF output, add bookmarks, identify your document (add title, subject, author, keywords), modify default PDF and Viewer options, choose how to recognize web links, add stationary, protect your PDF files. Besides, you will be able to save several files to a single multipage PDF file, navigate PDF pages, save your settings (or load already saved ones), and select whether to save your document or send it by e-mail.